Mystery Of Disney’s Tomorrowland Has Been Solved…Or Has It? The Mystery Of Disney’s Tomorrowland Has Been Solved…Or Has It? I’m slowly becoming obsessed with the secretive plot machinations of Disney and Brad Bird’s upcoming Tomorrowland. 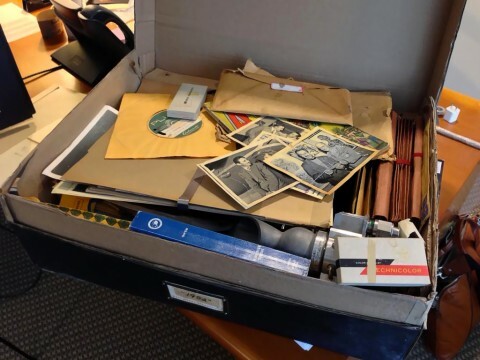 First the name was changed from 1952, then that photograph of the box containing all sorts of goodies was released, and now rumors abound concerning the contents of the box and what it all means! And the question I keep asking myself is: why do I care? I care because it’s the most clever marketing ploy I’ve seen in a long time, and I give respect to that. So here’s the latest rumor, a hypothesis based on the exhaustive analysis of the box by Walt Disney Archives director Betsy Cline and then interpreted by Disney historian Jim Hill (you will note that this is all in the Disney family, right?). OK, here we go. Hill hypothesizes that Tomorrowland is about Walt Disney’s involvement with an Army Project to let the world know that UFOs really exist. He bases all of this on the contents of the box, which Cline stated contained photos of Disney with Major Woodlief of the U.S. Army Reserve General Fund and a blue paperback book that references the Air Force Project Blue Book, meant to assess the validity of reports of flying saucers. So Hill claims that Tomorrowland will be all about the US government approaching Disney to do a documentary show about UFOs in order to release the information to the general public without causing mass hysteria. The show was finally scrapped when the government refused to actually release the footage of UFOs to Disney. Right. That’s the basic hypothesis and it sounds like a perfectly reasonable plot for a Disney film to me. What is beginning to get me about this whole thing, though, is how very seriously the folks over at Disney seem to be taking it. I mean, this is about Disney and the government believing in UFOs and making a documentary about it? Seriously? I’m feeling a bit skeptical about this whole thing, actually. But props to the marketing department over at Disney. You don’t really think that Hill or Cline would be releasing all this information if it wasn’t just an elaborate, probably misleading, marketing ploy, do you? This a major film with a major director (Bird) and a major star (George Clooney). They’re marketing it a year ahead of time. Clever, clever Disney. Tomorrowland will hit theatres December 19, 2014. Until then, expect even more speculation released very carefully by the Disney Corporation. No one does it better.